Photo of Joe Dale sharing apps. 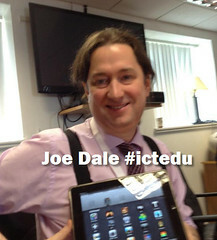 AT THE FRIDAY CESI Meet, more people retweeted Joe Dale's app recommendations than any other item. That's telling on several levels. Although there's obvious financial concerns surrounding decisions to put iPads into primary schools, the early adopters find eager listeners when sharing tips about apps that just work. Joe Dale's list spun my head around because his suggestions will immediately improve the workflow of every primary school teacher I know. I plan to update this blog post with a full listing of the apps he breezily described in a brief five minute presentation he made during the CESI Meet on the Thurles campus of the Limerick Institute of Technology. Bonus Link: List of 20 audio interviews of conference attendees made by young Irish students. Bernie Goldbach teaches creative multimedia to Honours Degree students in Ireland.